LauraLynn, Ireland’s Children’s Hospice provides respite, crisis and end-of-life care to children with life-limiting conditions, and support to their families, both in hospice and in the comfort of a child’s own home. There are almost 4,000 children in Ireland living with a life-limiting condition. Tragically 320 of these children pass away each year, about 70% of whom die in the first year of life. Sadly, despite this great need, LauraLynn are the only hospice in the country to care for these children and families. It costs close to €4 million to run LauraLynn and LauraLynn@HOME each year, and yet LauraLynn receive no direct government funding for their hospice services. They rely 100% on supporters to keep their hospice and hospice at home services running. The collection of batteries in your school will make a huge difference to the children and families of the charity. LauraLynn, Ireland’s Children’s Hospice has been WEEE Ireland’s charity partner since 2011. 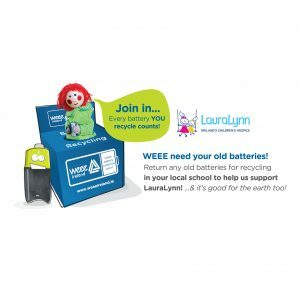 Since then, every battery recycled by the public in the blue WEEE Ireland battery boxes has gone towards a donation fund for the charity. 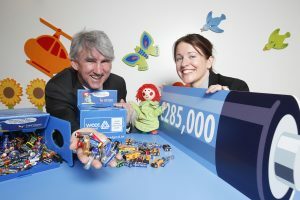 WEEE Ireland is delighted to deliver a further donation of €50,000 to LauraLynn, bringing its overall donation since 2011 up to a staggering €330,000.